NORTHBRIDGE, Mass.–(BUSINESS WIRE)–Riverdale Mills Corporation announces with great sadness the passing of company founder, owner, and retired CEO James Knott, Sr. Mr. Knott was 88. An inventor, entrepreneur, industrialist and philanthropist, Knott established Riverdale Mills Corporation in 1980 – transforming it from a startup with a single wire mesh product into a manufacturing giant with more than 3,500 different wire mesh product configurations for customers around the globe. Great innovators make their mark by challenging the status quo and finding new ways to do things better. James Knott, Sr. unequivocally fit this category as a profoundly influential innovator, whose products help millions of people. From spending summers in Gloucester, MA, Knott saw firsthand how much time and money lobster fishermen spent fixing their wooden traps. He was convinced there had to be a better way. Knott set out to build a more durable lobster trap to keep fishermen on the water making a living, instead of regularly onshore repairing their traps or building new ones. He invented and began manufacturing Aquamesh®, the first-of-its-kind marine-grade coated wire mesh. His innovative wire mesh lobster trap fished better and lasted far longer than wooden traps – benefits that eventually won over skeptical North Atlantic and Canadian Maritime fisherman. Today 85 percent of all lobster traps in North America are made with Aquamesh. Knott was awarded an honorary Doctor of Science by the University of Maine for his commitment to the future of the lobster industry, innovative spirit, perseverance and positive leadership, willingness to share his knowledge and ideas, and his outstanding support of the university’s Lobster Institute. James Knott, Sr. founded Riverdale Mills Corp. in an old abandoned mill on the banks of the Blackstone River in Northbridge, MA. There, he worked with his sons to restore the facility and property, while beginning mass production of Aquamesh. An integral part of the science leading to Knott’s innovative wire mesh product was his proprietary galvanized after-welding and PVC coating processes. Following the overwhelming success of Aquamesh in the lobster industry, Knott set out to expand and diversify the Riverdale Mills product line for other industrial, commercial and business applications. His virtually impossible-to-climb-or-cut WireWall® high security fencing is installed worldwide at embassies, transit centers, ports, borders, military bases, manufacturing and power plants, and other sensitive locations where perimeter security is a critical safety and deterrent need. His welded wire mesh is also used extensively by professionals in the horticulture, agriculture, aquaculture, construction, and water treatment industries. 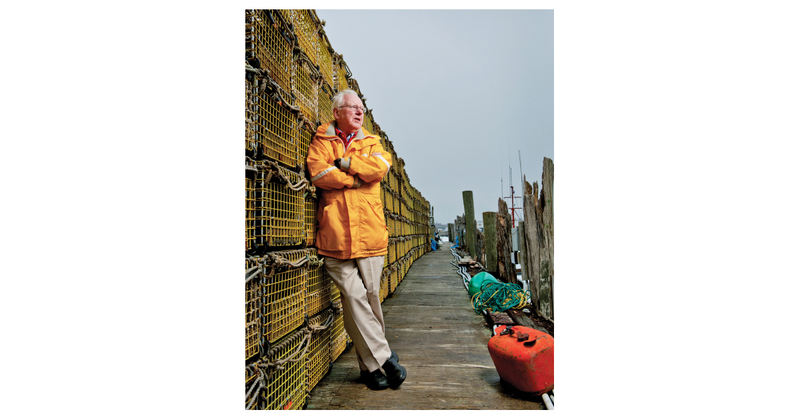 After nearly 40 years in the wire mesh business, James Knott, Sr. touched the lives of millions of people –starting with his customers and including all the people who unbeknownst to them benefited from his products with abundant lobster, perfectly cultured oysters, and protection from security breaches. He had a special place in his heart for his dedicated employees, many of whom have been with Riverdale Mills for decades and admired and respected his leadership and humanity. Knott’s vision and creativity are evident in many aspects of his remarkable life and inspiring career. He earned an economics degree from Harvard College, studied mechanical engineering at Northeastern University, and served two years as a lieutenant in the Army. Before starting his own company, he was CEO of Coatings Engineering Corporation, the world’s largest custom plastic coater. He was also a long-time Director of the Gilbert & Bennett Manufacturing Company of Georgetown, CT. He also modernized the mill with efficiency in mind, restored the natural habitat, tapped the river for hydropower, and instituted recycling of all the steel from the manufacturing process. Knott was an ardent supporter of the lobster industry, funding scholarships and research. He was also active in the communities of the local Blackstone Valley and the fishing mecca of Gloucester. Predeceased by his cherished wife Betty, who died in February after 67 years of marriage, Knott is survived by four children, including James Knott, Jr., the CEO of Riverdale Mills since 2015, and four grandchildren. Arrangements are forthcoming.